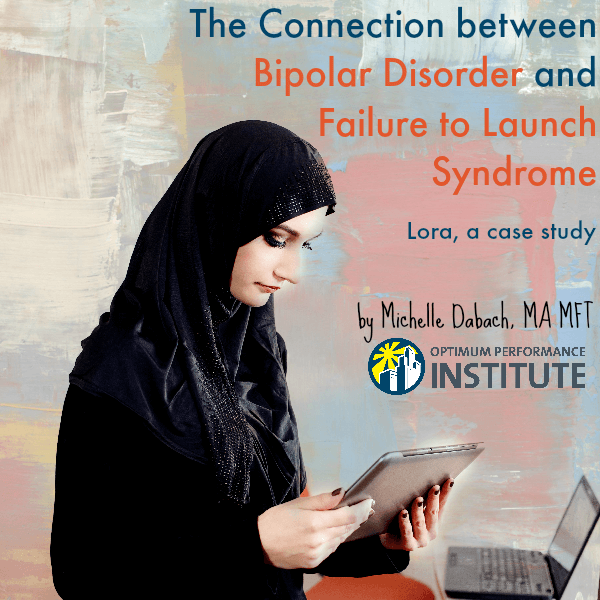 To understand how bipolar disorder and Failure to Launch Syndrome are connected, one must first understand them separately. Bipolar Disorder is classified as a manic-depressive illness. It causes intense mood shifts in one’s everyday life. This is different than commonly experienced highs and lows. Bipolar Disorder moods range from mania, evidenced by extreme happiness, hyperactivity, and over-excitement to extreme irritability and explosiveness to depression, evidenced by extreme sadness and/or hopelessness and often accompanied by suicidal ideations. Symptoms of a manic episode may include feeling “high,” being overly happy and outgoing, and/or being extremely irritable. A manic episode may exhibit with behaviors such as rapid talking, distractability, being restless, taking in little sleep, jumping from one idea/activity to the next, and being impulsive. Symptoms of a depressive episode may include a longer than normal period of sadness and anhedonia, or a loss of interest in activities one used to enjoy. A depressive episode may exhibit behaviors such as feeling tired or slow, inability to concentrate, irritability, restlessness, and/or thinking of death or suicide. Failure to Launch Syndrome is classified as the inability to transition from childhood to adulthood successfully. Members of this group are unable to manage the challenges associated with transitioning to adulthood. Symptoms might include having an unclear purpose in life, little ambition, lack of motivation, intense procrastination, not caring about money or earning it, and/or social isolation. Adults categorized as having Failure to Launch Syndrome seemingly have ideas but fail to act on them or give up easily. They appear to be satisfied with the status quo, though might verbalize a want for change. Lora, a 25 year old Middle Eastern woman, was a college graduate who came to therapy for help “figuring out [her] life.” She was a web designer by default, but had her hand in many artistic fields – making crafts, cooking, drawing. Lora lived with her parents and had never been in a romantic relationship. She quit her job as a website designer because it was “boring,” and there was no room for growth. She decided to become a chef instead and took an 8-week cooking class. Upon completion, she was hired as a line cook and decided three weeks into the job that it wasn’t for her. She then decided she wanted to write children’s books. She took meetings with editors and attempted to come up with a story. After a few weeks, she decided it was too difficult and gave up. Lora also decided she wanted to move out of her parents’ home because it was holding her back, yet she couldn’t maintain a job that would help her pay for rent elsewhere. She had difficulty making new friends, and despite being encouraged to find groups with folks who had similar interests, Lora was content to stay home and clean or search for a new job. Lora was classified as suffering from Failure to Launch Syndrome, secondary to her bipolar diagnosis. So, the question becomes: how are bipolar and failure to launch syndrome connected? There is an obvious overlap between the two – Depression. Depressed individuals have very little motivation, experience sadness and social isolation, and, as such, procrastinate. This can lead a young adult to great difficulty in moving on with their lives and transitioning successfully into adulthood. When the support group, often parents, try to overcompensate by making the young adult feel comfortable in the home and try to “help,” it often backfires and encourages the young adult to not take initiative, because everything is being done for them. The young adult then falls deeper into their depressive episode and remains in the home. If and when the young adult hits a manic phase, they are so “high” and enthusiastic about everything they are able to do, that they try to meet unrealistic goals – and more than one at that! This sets them up for failure and, inevitably, they fall back into their depression, and the support group comes to the rescue once again. This only perpetuates the disappointment and failure to move forward in a healthy manner. If their bipolar disorder is not addressed, these actions end up in a vicious cycle and the support group eventually becomes the enemy. The good news is that with treatment, healthy coping skills, and a solid support group those suffering with bipolar disorder can live a full life while managing their symptoms. Assisting one’s young adult with achieving small successes can help with successfully moving forward into adulthood, which tackles their failure to launch syndrome as well. If you enjoyed this article, you may like to next read: Bipolar: How it can impact the ability to maintain a steady job and how we help. At Optimum Performance Institute, we offer compassionate, clinically sophisticated intensive residential help for young adults who suffer from bipolar disorder, including genetic testing to determine the best course for medications as needed. Rather than a sterile, hospital-like environment, we offer beautiful accommodations in luxury apartments just outside of Los Angeles. At OPI, we treat the individual, not the diagnosis. We are a diverse community of passionate, highly skilled individuals working together with you to help you find your joy and express it. For more information on OPI residential programs and our measures to help young adults with Bipolar Disorder, call us at (888) 814-5985 or click HERE to submit an online form. We’ll be in touch promptly.